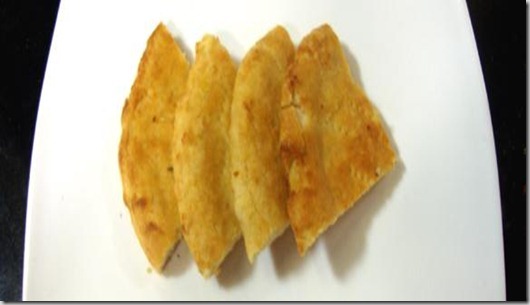 Taftan is a leavened flour bread from Persian cuisine, Uttar Pradeshi Cuisine (India) and Cuisine of Pakistan, with saffron and small cardamom powder baked in a clay oven. In a bowl, mix together 2 tbsp. of self raising flour, 2 tbsp. of yeast, and 2 tbsp. of sugar and 3 tbsp. of Luke warm water. Leave aside for 4 -5 minutes. In a separate bowl mix the plain flour with 1/4 cup powdered milk, 8 tbsp. yeast, and water mixture. Knead for 10 minutes till smooth dough is formed. Brush it with oil, cover and leave aside for 45 minutes. Press the dough with your hands and divide into six rolls. Grease a griddle. With the help of a rolling pin, roll out the 6 balls of dough. Place each disc onto the griddle, and brush oil on top. Place the taftan in an oven for 30 minutes. Then place the griddle on a low flame and cook the taftan until it turns golden brown. Flip over and cook the other side. Brush oil and water l on top of each taftan and serve. Why is the “saffron and small cardamom powder” in the title not in the ingredients?